Hi my name is Karin Seder. Most of you know me as the “church Secretary” and my job and this church are a big part of my life. 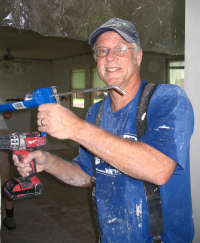 This was my second mission trip and although Terre Haute, Indiana might not be as exotic a location as the mission trip to Nicaragua in 2006, this trip was certainly as rewarding. We were fortunate to have a project that was just right – the home was owned by a single father with two growing boys, the place was a mess, and it was obvious that Charles (the owner) had been working hard, trying to put his home back together and he was struggling to get things done. We never got to meet Charles or his boys – he worked long hours as a correctional officer– but we did write notes to each other. As I said, this project was just right. It was a mess, the job looked overwhelming and the place was unlivable. With the help of our crew, Tom Larssen, Jim Dempsey, Nancy Dempsey, Joyce Cox, Jane Huneke and myself, we were able to make a huge difference in the project and in the lives of Charles and his two boys. We put up sheetrock, in the bedroom, hallway, kitchen eating area and family room – actually a garage being converted to a family room. We faced a few challenges – namely that Tom and Jim were the only experienced members of our team. What the rest of us lacked in experience, we made up for in enthusiasm and the willingness to tackle just about any job that came our way. We were an unlikely construction crew – 4 school teachers, a physical therapist, and a church secretary. Who knew? Tom and Jim became our leaders and our teachers. They had patience showing us how to do a job and their lack of complaint with letting us work along side them -- without laughing at our mistakes or false starts -- and allowing us to do the job for ourselves -- transformed not only the walls in Charles’ home, but transformed us with a sense of accomplishment and camaraderie that can only come from working together to achieve a common goal. We meshed into a great team! This might sound like a very mundane honey-do list to some, but the work was fun, it was exhilarating and it was exhausting. The transformation to the house was amazing. In a note that Charles left for us, he said that the house looked great and that he couldn’t believe how much we accomplished and he called us amazing. And in our visits to different groups who volunteered to feed us dinner, they commented on how grateful they were for our help and how amazing it was that we came all the way from California to help families we even didn’t know in Terre Haute, Indiana. But what I found to be truly amazing was how wonderful it felt to be a part of this group and to be able to help our distant neighbors who were struggling to put their homes back together after a disaster so they could begin to put their lives back together. Now, I am not an experienced carpenter and except for painting, there weren’t many job skills I thought I could contribute to this project. But I wanted to go and as a result of this trip, there are a few things I would like to share with you. 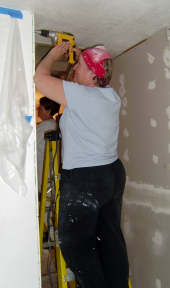 First, I could now help you hang sheet rock, measure, mark the studs, score and make the cutouts, and using an electric power drill, screw the sheetrock into place. And it would all fit and look pretty good. Secondly, I want to encourage each of you think about going on the next Mission Trip. I didn’t have a resume filled with the right set of job skills for this kind of work, but I had a desire to serve and a willingness to learn. My sons were concerned that maybe I was too old to be doing this sort of thing – they were surprised to find out that at age 55, I was the youngest member of the team. You don’t need any special skills to participate – just the desire to help. The desire to make a difference. And finally, what can I say... Power Tools Rock! Give it a try!